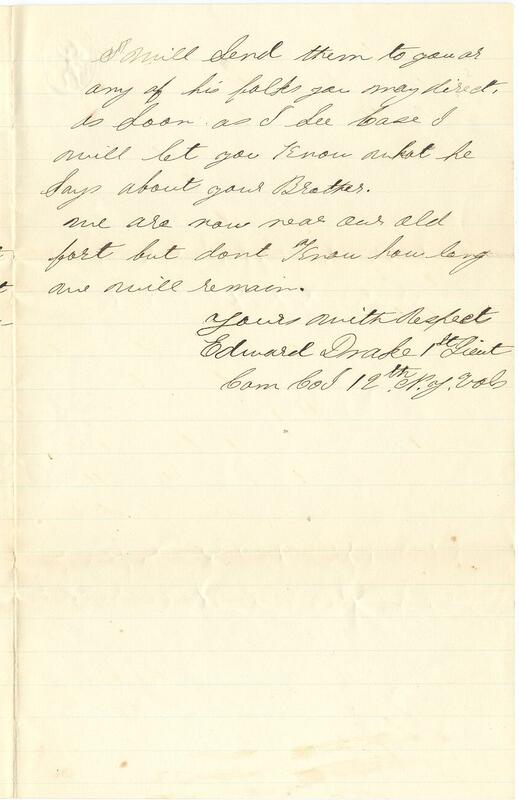 Item description: Letter, 11 September 1862, from Lieutenant Edward Drake to Mrs. A.H. Hall (first name not known), sister of William Ray Wells, private in the 12th New York Infantry Regiment (“Onondaga Regiment”). Item citation: From the William Ray Wells Papers #2960-z, Southern Historical Collection, The Wilson Library, University of North Carolina at Chapel Hill. Your note baring date of Sept 8th /62 inquiring about your Brother W.R. Wells is at hand & I hasen to give you all the particulars & facts that are in my posession in relation to his death if he is dead but there is nothing sertain of it as yet. 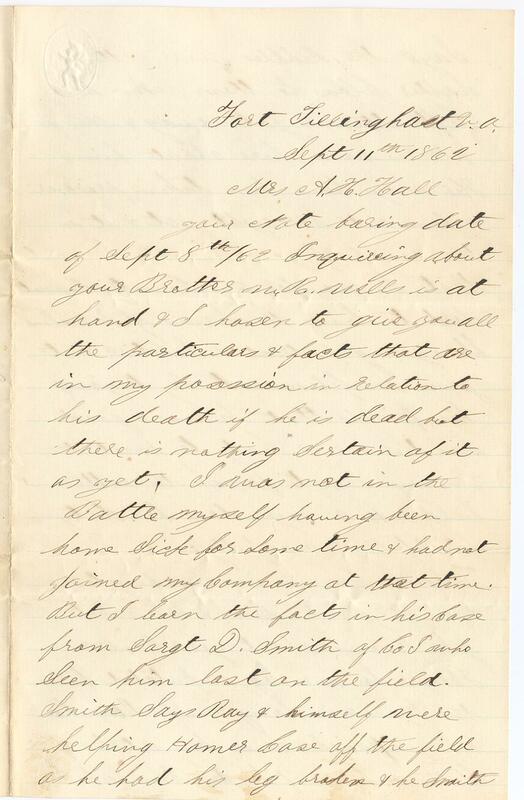 I was not in the Battle myself having been home sick for some time & had not joined my company at that time. But I learn the facts in his case from Sargt. D. Smith of Co I. who seen him last on the field. Smith says Ray & himself were helping Homer Case off the field as he had his leg broken & he Smith says the Rebbles were getting rather close to them when he left them & got away & this is all is none here about him. He may have been taken prisoner & came out all right yet & it is the wish of your humble servant that he may for our country cannot aford to loose the servis of so valuable a young patriot & soldier & it gives me pleasure to say to you & his friends that he was a good soldier & ever ready to meet the enemy face to face on the battle field & he always done his duty faithfully & manfully. 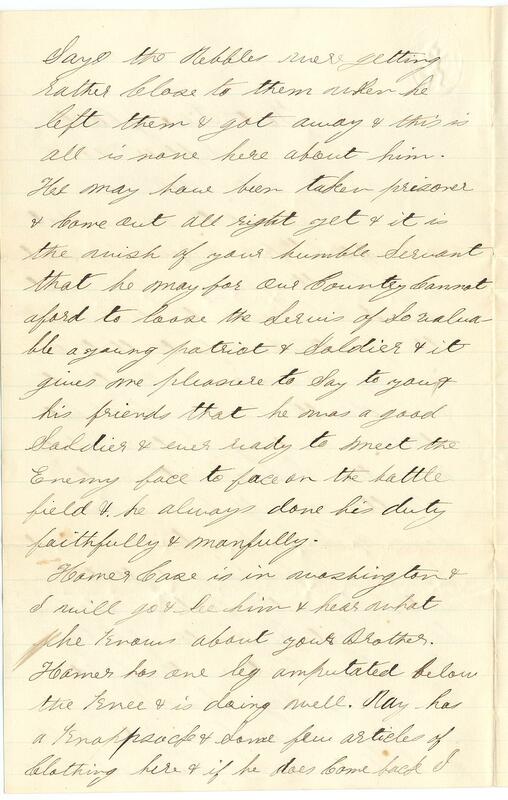 Homer Case is in Washington & I will go & see him & hear what he knows about your Brother. Homer has one leg amputated below the knee & is doing well. Ray has a knapsack & some few articles of clothing here & if he does come back I will send them to you or any of his folks you may direct, as soon as I see Case I will let you know what he says about your Brother. We are now near our old fort but dont know how long we will remain. Cam Co I 12th N.Y. Vols. 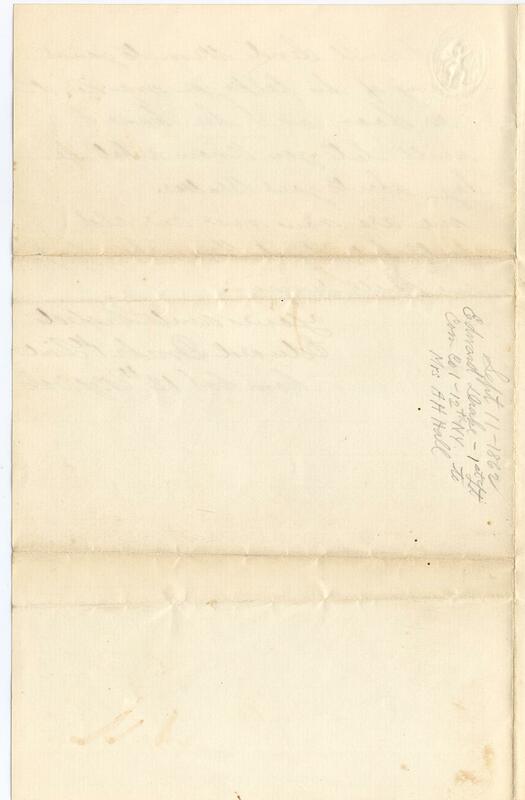 This entry was posted in Southern Historical Collection and tagged 12th New York Infantry Regiment, casualties, Edward Drake, family, New York, Onondaga Regiment, William Ray Wells. Bookmark the permalink.